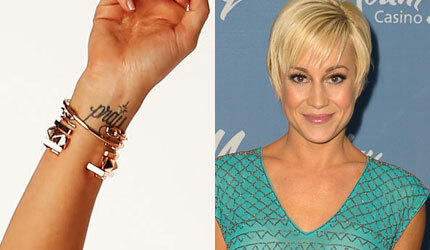 Kellie Dawn Pickler is one of the most popular American singers who have made a mark in the arena of country music. She was born in the year of 1986, in North Carolina. She came under the spot light during the filming of the sixth season of the famed program of American Idol. She did not win the title but her talents were recognized by all. Then she took on the entertainment business and started producing one album after another. She has also made many appearances in a number of television shows. She says that getting tattoos is like an obsession for her. Apart from singing and creating music, getting tattoos is also a way of speaking her mind. Her talents are not only limited to singing like a canary but she has also gained a lot of popularity with her ventures as a song writer. She has been a big fan of scripted tattoos and this is the main reason as to why she chose to get a wrist tattoo and a foot tattoo, in order to give out a message of devotion and love. Though these can be interpreted in the way people want, Kellie has her own versions.